Discover all the possibilities Finn Hall has to offer through this personal journal of adventures that take place in the historic Jones on Main at 712 Main Street. 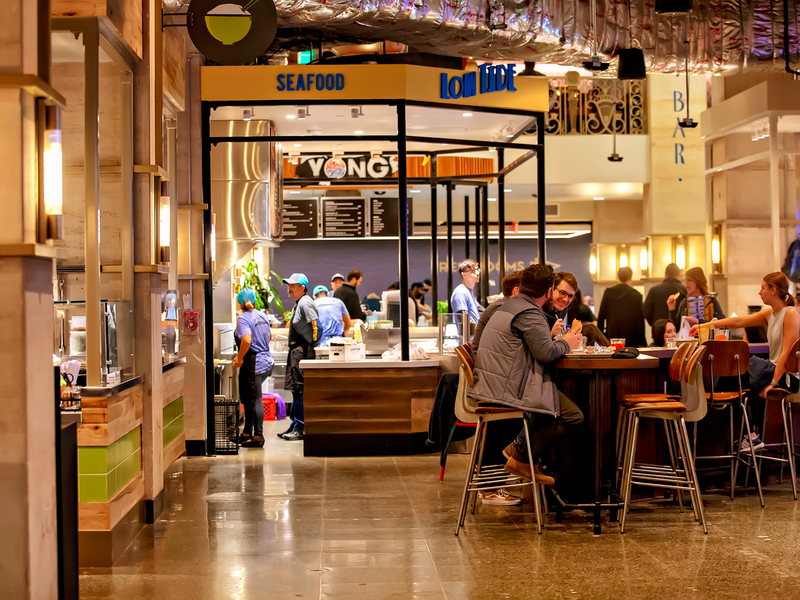 A food hall with 10 independently operated eating establishments, plus two full bars, it’s a great place to grab a solo weekday lunch, or plan a group get-together for a grand weekend outing. 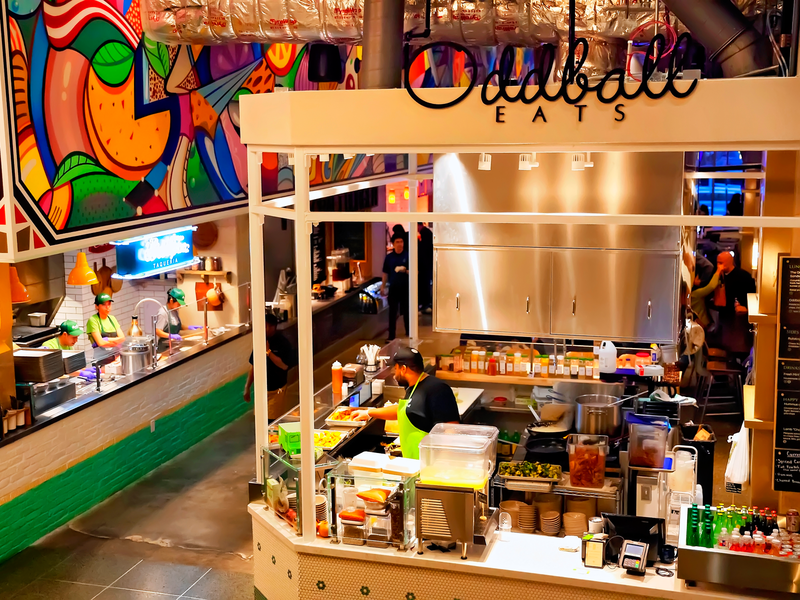 It’s open for every meal (though different vendors’ hours do vary), opening at 7 a.m. on weekdays and 8 a.m. on weekends, with different closing times throughout the week. It’s exciting to have quality coffee steps away from the office. With the single-serve coffee maker at work, I’d forgotten what a difference it makes to have fresh-roasted beans. It was a Monday, and I got a pour over instead of my usual drip to help get my mind right for the week. It was worth the extra few minutes it took to brew. 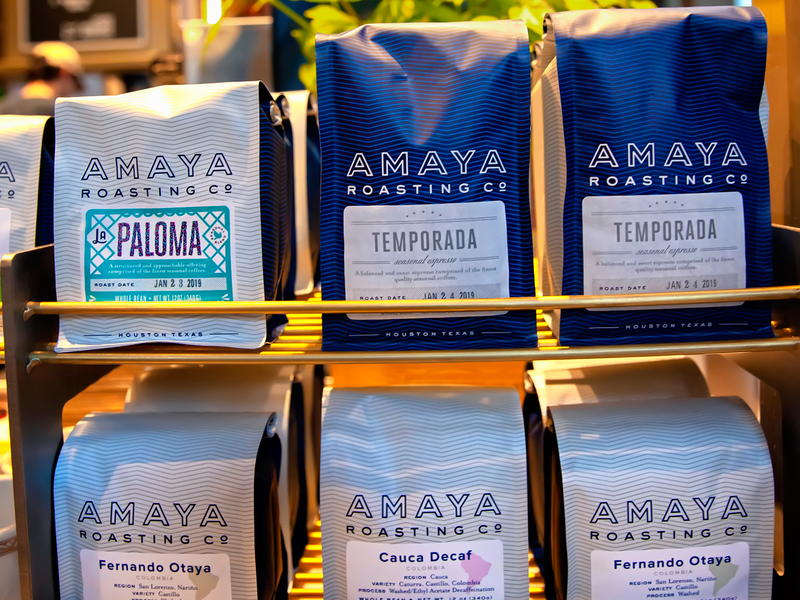 While I waited, the barista told me that Amaya sources coffee from Indonesia, Central and South America and Africa. They’re also the same roaster behind Catalina Coffee Shop, Giant Leap, and other shops around town. Reminder: looks like Wednesday will be a late night at the office, so break at 4:30 p.m. to grab an affogato. Today I took advantage of a 70-degree and sunny Friday to leave work a little early to grab some oysters on the half shell. Though technically not a “summer” Friday, the happy hour and raw seafood bar at Low Tide definitely put me in that state of mind. Also, what a treat to have such easy access to fresh oysters. There was no way I was passing up an order of hushpuppies studded with bacon and onion – and just to gild the lily – I went all out and tried the crispy crawfish étouffé balls. Went great with a draft beer I ordered and brought over from the St. Jac’s bar up front. Next visit, I’m going for a different vibe with fish ceviché and cured salmon. Good news: I now have access to Mala’s amazing red oil dumplings EVERY DAY – thank you, Finn Hall. Bad news: I now have access to Mala’s amazing red oil dumplings EVERY DAY, and will have to find some discipline. Yesterday, I also tried something new, and happy to report that the Kung Pao chicken hit the spot and a taste of my co-worker’s basil crispy chicken is exactly how I remembered it. I even had leftovers for this weekend. My lips are still pleasantly tingling. Szechuan peppercorns are fascinating. With college friends in town for the weekend, I was debating a good spot for Saturday brunch. Decisions, decisions. Because it’s got a lot of options under one roof, we all decided to head to Finn Hall. Here’s the funny part, we all decided to eat at the same vendor after reading their menu: Oddball Eats. I’d been eyeing their stall and this was a great excuse to see if the Mediterranean-inspired food lived up to my expectations. Annnnd I’m kicking myself for not having been before, because the Ful Plate and a side of crispy potatoes with amba was the perfect way to spend a Saturday morning. Plus, I felt pretty good eating a ton of vegetables on a weekend and my friends loved their shakshuka and lamb chorizo hash. After a full day of Houston sightseeing, we decided to swing back by Finn Hall for a nightcap upstairs on the mezzanine full service cocktail bar Swallow’s Nest. It was my first time checking it out and I was pretty stoked to find out that not only is it open until midnight on Saturdays, you can order from any of the vendors downstairs and they’ll bring the food to you. I opted for an ice-cold martini, which went well with a side of truffle mac ‘n’ cheese from Dish Society. My college friends finally flew home this morning. We had a blast, but too many nights out on the town took a toll on my bank account and, let’s be honest, my sanity. In desperate need of some hangover food, I tried Craft Burger’s ‘morning after’ burger. Instead of buns, the patty is served between savory waffles and topped with a sunny-side-up egg, candied bacon and smoked Gouda. Holy flavor, Batman. This was the perfect balance of sweet and salty to help settle my growling stomach. I was too stuffed to try the loaded sweet potato fries, but I’m sure I’ll be back to try some of the pork-, dairy- and gluten-free options anyway. Note to self: when you’re feeling under the weather and head into work anyway, a bowl of pho bo from Sit Lo may be the only remedy. Though my go-to is the grilled tofu or the bun ga nuong, I just really needed that warm broth to get me through the afternoon slog. OK, and I couldn’t resist getting an Imperial Roll (that crunchy texture gets me every time). I got off work a little late, and didn’t feel like cooking, so I stopped by for some chicken tortilla soup and chimichurri steak tacos with cabbage, black beans and cotija cheese. I almost chose the build-your-own farmer’s plate, but the garlicky chimichurri won me over in the end. I love that the ingredients used here are locally sourced – which makes me feel even better about eating here. 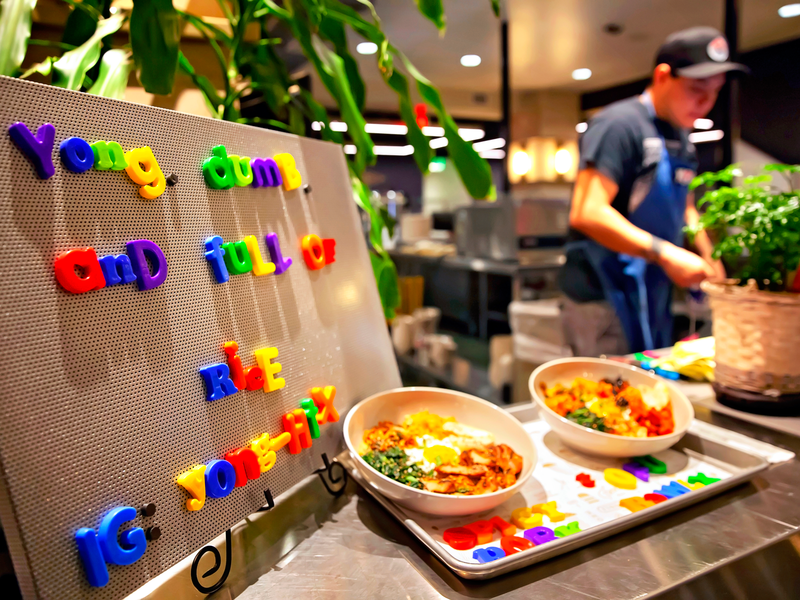 After lots of wandering around the food hall admiring all the Art Deco details I’d missed on earlier visits, my co-workers and I ended up at Yong. The Korean fried chicken wings were calling to me, but I decided to go for the bulgogi bowl instead. I really enjoyed the generous serving of rice layered with smoky grilled pork, hot off the flame, plus egg and veggies. I’m usually heavy-handed with the soy sauce and Sriracha, but the gochujang sauce served here was perfect – I didn’t add a thing. My coworkers tried the tofu bowl and the kimchi & lamb soup and gave both a big thumbs up. We all joked about licking our bowls ... OK, maybe that wasn’t a joke after all. I always knew Goode Co. for their barbecue and seafood, but tacos? I was intrigued. One week later, and I’m still thinking about the carnitas tacos and those pork and green chile guisada breakfast tacos. Headed back today for the 1836 salad because I’m feeling something fresh – and yeah, there’s bacon, corn and avocado in there, so I’m sold. It’s been a long week, so I decided to meet up with some friends at the front bar. 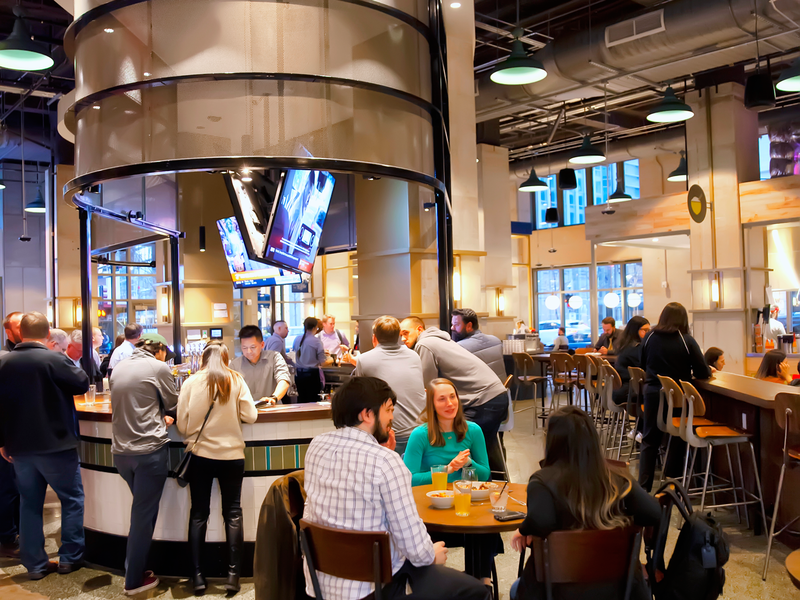 They’ve got a great selection of local draught beers, plus wine on tap, too, which makes service really quick and easy – which was good, because it was starting to get a little crowded. 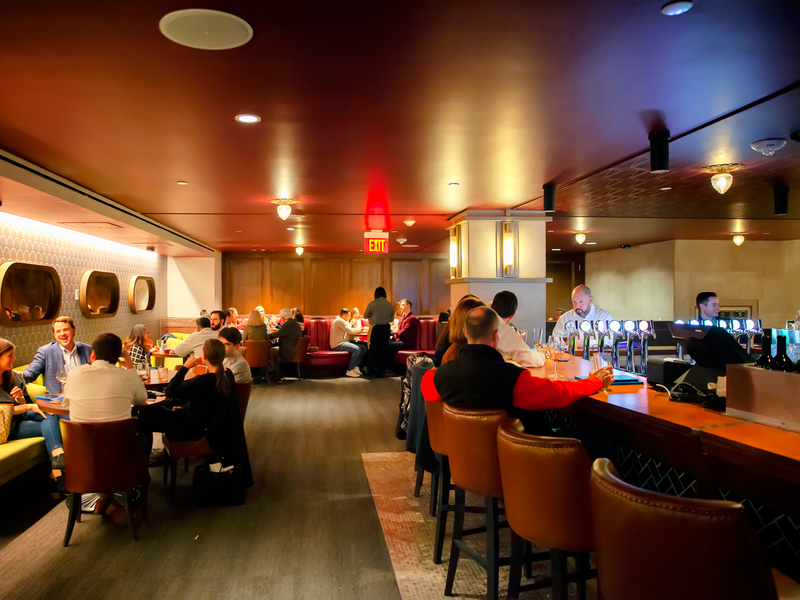 It just so happened to be happy hour, which falls from 3-6 p.m. and 9-11 p.m. on weekdays, and 1-6 p.m. on weekends. I went for one of their $10 cocktails, frankly, because I liked the name. The DJ Screwdriver has grapefruit vodka, orange liqueur, Aperol, orange juice with a splash of sparkling wine. Bonus: I felt really smug explaining who DJ Screw (RIP) was when my friends didn’t get the reference.